I thought I was prepared for the start of the New York City Marathon. I asked many questions of Uncle Sandy and Aunt Mary, who had run the race several times, and of my friend Tony, also a NYC Marathon veteran. I read "A Race Like No Other" by Liz Robbins, a book detailing the 2007 NYC Marathon. 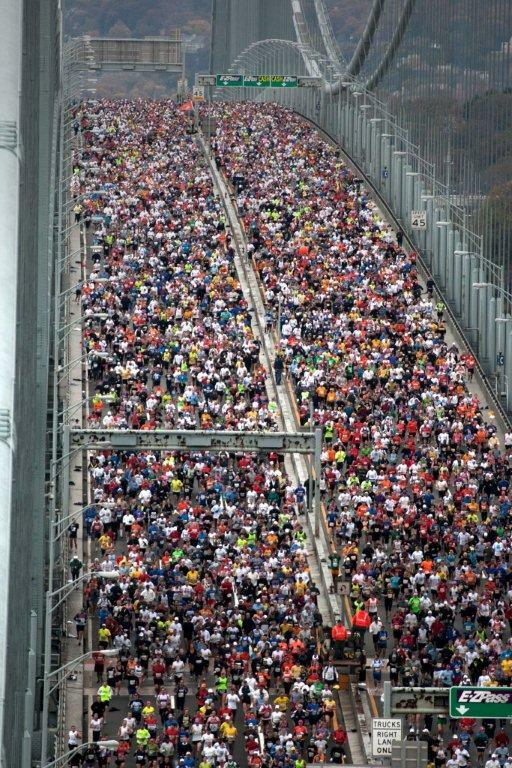 But on November 1, 2009, at the beginning of the Verrazano-Narrows Bridge on Staten Island, when Mary Wittenberg, President and CEO of New York Road Runners and Race Director for this marathon, announced, "New York City is waiting for you! ", and the Howitzer cannon blasted, and those opening strains of Frank Sinatra singing "New York, New York" filled the air, I was speechless and couldn't move. Me, running the New York City Marathon? Then everyone around me starting walking, then jogging, then running as they hit the start mat at the base of the bridge. Surrounded by runners from all 50 States and 100 countries, I had no choice but to follow. My feet hit the start mat and there was no looking back. New York City was waiting for me! In 1970 127 runners ran the first NYC Marathon. On the 40th anniversary of the race, 43,475 runners finished the race. And one of them was me. For a little over 5 hours, I ran through all Staten Island, Brooklyn, Queens (where I was born), the Bronx, and Manhatten. 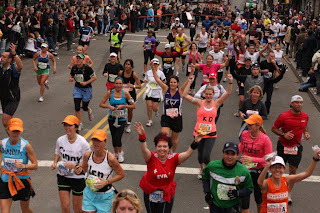 I didn't have my I Pod with me (highly discouraged in a marathon) but I was never bored. 2 million spectators lined the streets, cheering for us, calling out our names (mine was written on my shirt) and providing much needed moral support. Some of the heroes of 9/11, NYC policemen and firemen, were out in full force cheering us, when I felt like we should have been cheering them. 130 bands also lined the streets. Some were official groups, such as the full orchestra with the gold robed chorus in front of a Korean church, and the high school marching band in front of Bishop Loughlin HS playing "Gonna Fly Now", the theme song from the movie "Rocky". Others were unofficial, such as bagpipers on street corners and an elderly Asian woman banging a gong from her fourth floor balcony of her apartment building. Their music kept my energy up and kept me going. What I didn't expect was that the other runners would keep me running. They were a very diverse bunch of people. 51% of the runners were from other countries, and most of them proudly wore their running shirts proclaiming their home countries. Fred Lebow established this rule at the time he founded the race. 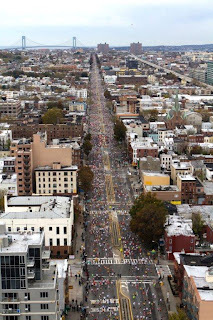 A Holocaust survivor, Fred wanted to repair the world as best he could, and being a runner, this was his way - to bring all the world together by running in New York City. I was moved almost to tears when I saw 2 runners in front of me at one point. Both were men, too young to have been living during the Holocaust. One had a tattoo on the back of his leg, a Star of David surrounded by barbed wire with the words "Never Again". The other man, running right next to him, wore a running jersey proclaiming him as a runner from Germany. I wish Fred Lebow were still alive to see his dream come true. Many runners wore costumes, such as the two guys running as the Blues Brothers, two men running as nuns, a guy dressed as a tennis player, complete with tennis whites and a racquet, and even a woman dressed as a suburban mom (more on that later). They were fun to watch. But what inspired me more than anything were athletes who overcame physical handicaps to run this race. I saw a Korean runner who had no arms. Even legs weren't necessary for some people to run 26.2 miles - I saw one runner without a leg, with a running hook for the other leg, and one runner who was missing both legs running on two running hooks. And at one point I heard from behind me "blind runner coming through" (so THIS is why I Pods are discouraged, I figured out) and I watched as a blind man, tethered to his friend, ran past me. 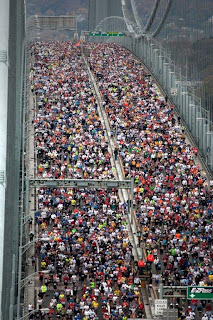 If all these people can run a marathon, then all of us can do anything we want, anything we set our minds to. How humbling. It made me want to go out and conquer the world, and believe that I could. The highlight of the race for me took place in between mile 16 and 17 (after we had just run the Queensboro Bridge, the most grueling of the 5 bridges we ran during the 26.2 miles). I ran right by the Memorial Sloan-Kettering Cancer Center. I was running this race as a charity runner with Fred's Team, named for Fred Lebow, who died of cancer years after founding this race. 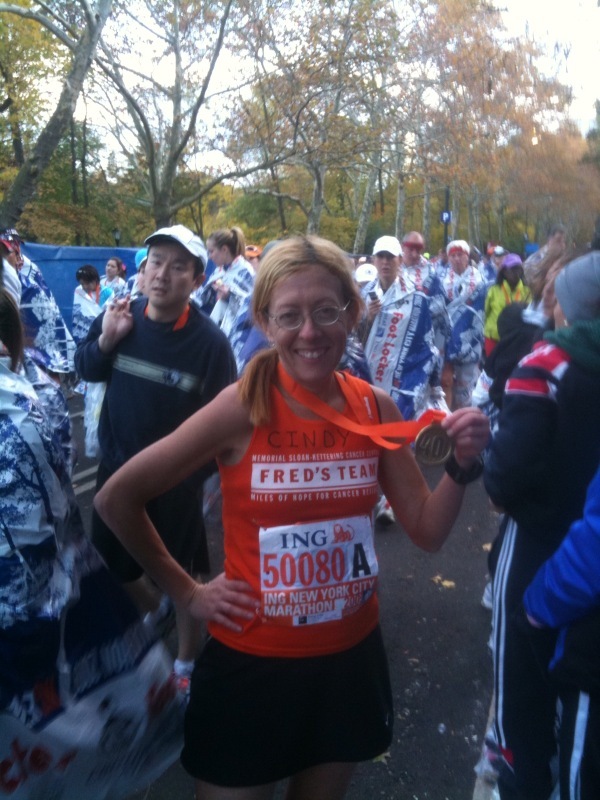 We Fred's Team members raised money for pediatric cancer research at Memorial Sloan-Kettering Cancer Center. Doctors, nurses, families, and most important, many of the kids who had received or are receiving cancer treatment were right there in front of the hospital, cheering me on as I ran by. Some of the kids, done with their treatments, looked as healthy as could be, others were bald and lying on hospital beds, but all were cheering for me, calling out my name, and making me feel like the biggest rock star in the world. The leader of Fred's Team was in front of them, yelling out, "Cindy, this is for you!" The last few miles of the race were very tough for me. I had a stress reaction on my groin muscle from overtraining on August 2, and didn't run much at all the rest of August or September. I started up significant running slowly in October but only got 1 long run of 13.1 miles in. Nothing was going to stop me from running this race, but my legs just kind of stopped for a moment and I was worried about finishing. So then, like I've done in other parts of my life that were challenging, I just kept going, knowing I'd eventually see the finish line. When I felt like I couldn't stand up anymore, I saw those trees in Central Park with their brilliant multi colored leaves of red, orange, green, and brown, and I saw the signs: 1 mile to go, 1/2 mile to go, 800 meters, 400 meters, 200 meters, .2 mile, FINISH! Somehow my legs came back to life and I ran fast to the finish line, knowing I did it, I raised $3,550 for pediatric cancer research and I finished this race! One of the many hundreds of volunteers handed me my medal; another handed me my mylar blanket and yet another handed me a bag of food and drinks. Then I began walking towards the end of the park where I would somehow find my way back to my hotel, even though my legs felt like rubber. And then I saw her: she must have been a runner, because she, too, had a mylar blanket, but she was dressed like a suburban mom. This woman was taking pictures of runners and she looked suspiciously like my college roommate and all around great friend - and then I said, "Kim"? And Kim said "Cindy! Congratulations!" Turns out Kim was trying to find Barb (our other college roommate, who started with her friend Ed in a wave 20 minutes ahead of me) and me, and she figured a good way to find us was to, um, "liberate" a runner's blanket so she could fit in with the runners and find us in the runners area after the race. Kim found us a taxi, which we shared with a husband and wife from Minnesota who had just run the marathon, then found us another taxi when the taxi driver decided to go off duty after he dropped off the first two runners at their hotel. That's Kim; always there when I need her! And the celebration began. We met up at Carmine's, an old style Italian restaurant with huge portions of delicious Italian food. The ten people at the table were me, Uncle Sandy and Aunt Mary and their daughter (my cousin) Charlene, Uncle Jerry and Aunt Lee, Barb and Ed and Barb's friend Marcie, and Kim. 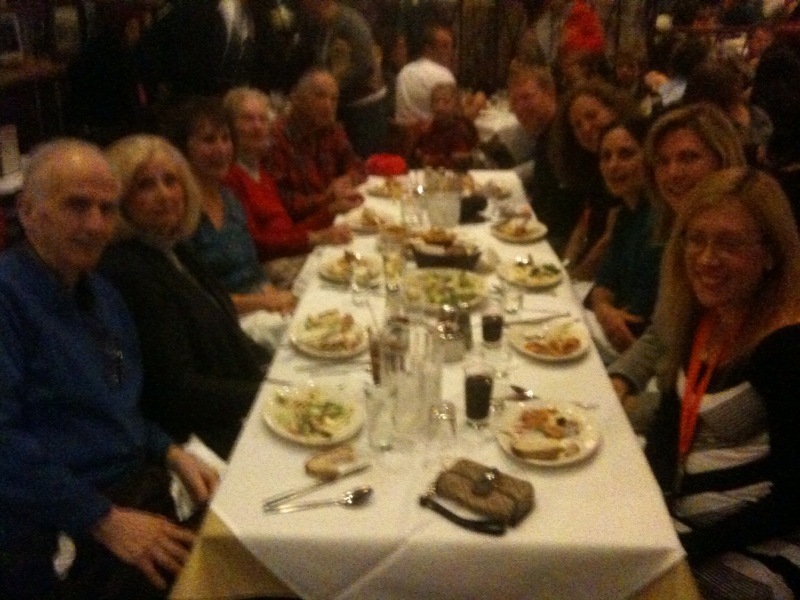 Barb, Ed, and I held court as we regaled everyone with our stories of running in the world's largest marathon. I wish Debbie (childhood friend from NJ) and her husband Chuck could have been there but we had our own adventures with them the night before at our pre-marathon dinner in Little Italy (that evening deserves a blog entry of its own!) 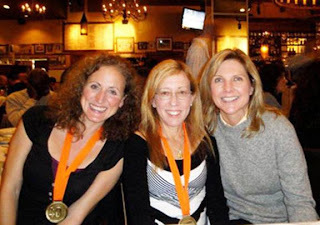 I loved every part of that night, sore legs and all: celebrating with family and friends, showing off our medals to everyone in the restaurant, including all of the other runners at other tables, and the feeling of a job well done. There are so many people to thank who got me here: my running coach Doug B., Doctor Bruce T., physical therapist Jeremy S., all the people who donated on my behalf to Fred's Team, my friends and family who celebrated with me in NYC, and Larry, always Larry, who sees every challenge as an opportunity to excel and got me here successfully as well as so many other places in my life. People, mostly other runners, ask me what my time was in this marathon. I tell them my official time of 5:11. Runners who know my history look a little sad, since this is way slower than my time of 4:31 at the Disney World Marathon in January. But each marathon is different, like each experience in life. 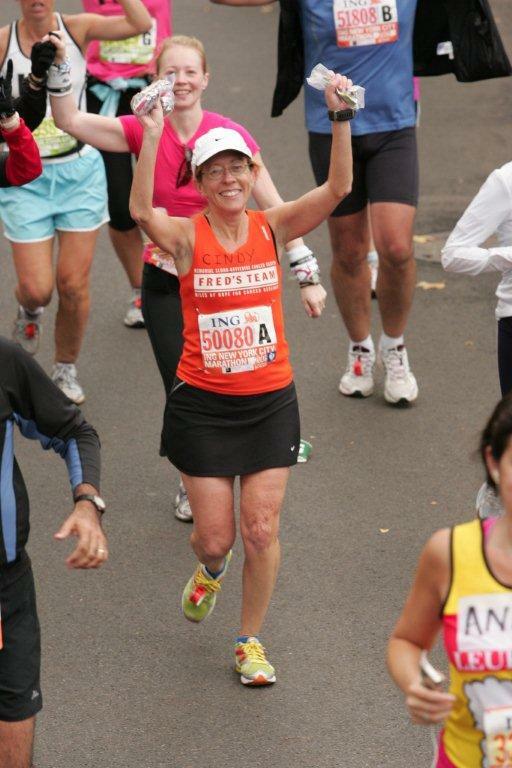 And my time of 5:11 in the New York City Marathon on Nov. 1, 2009? That was the time of my life.